307 pages | 16 Color Illus. | 114 B/W Illus. 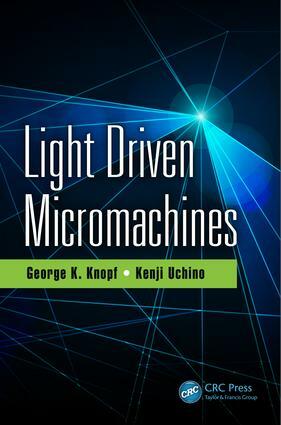 In Light Driven Micromachines, the fundamental principles and unique characteristics of light driven material structures, simple mechanisms and integrated machines are explored. Very small light driven systems provide a number of interesting features and unique design opportunities because streams of photons deliver energy into the system and provide the control signal used to regulate the response of the micron sized device. Through innovative material design and clever component fabrication, these optically powered tiny machines can be created to perform mechanical work when exposed to varying light intensity, wavelength, phase, and/or polarization. The book begins with the scientific background necessary to understand the nature of light and how light can initiate physical movement by inducing material deformation or altering the surrounding environment to impose micro-forces on the actuating mechanisms. The impact of physical size on the performance of light driven mechanisms and machines is discussed, and the nature of light–material interactions is reviewed. These interactions enable very small objects and mechanical components to be trapped and manipulated by a focused light beam, or produce local temperature gradients that force certain materials to undergo shape transformation. Advanced phase transition gels, polymers, carbon-based films and piezoelectric ceramics that exhibit direct light-to-mechanical energy conversion are examined from the perspective of designing optically driven actuators and mechanical systems. The ability of light to create photothermal effects that drive microfluidic processes and initiate the phase transformation of temperature sensitive shape memory materials are also explored in the book. This compendium seeks to inspire the next generation of scientists and engineers by presenting the fundamental principles of this emerging interdisciplinary technology and exploring how the properties of light can be exploited for microfluidic, microrobotic, biomedical and space applications. "The book is beneficial to all researchers in the area of optics, since the subject of the book is developing very fast due to advanced micro- and nanotechnologies." George K. Knopf is a Professor in the Department of Mechanical & Materials Engineering at the University of Western Ontario (Canada). His areas of expertise and research interests include intelligent systems for design, laser microfabrication, micro-optics, optical microactuators, biosensors and bioelectronic imaging arrays. Past contributions have been to the development of intelligent systems for engineering design including studies on the characterization of micro geometry flaws in product data exchange, efficient packing of 3D parts for layered manufacturing, and the adaptive reconstruction of complex freeform surfaces. The innovative surface modeling algorithms have been applied to the reconstruction of complex bone geometry and fragmented archaeological artifacts. Other contributions include self-organizing feature maps that convert large numeric data sets into geometric forms for interactive data exploration and visualization. In recent years, the focus of research has significantly expanded in the areas of laser microfabrication, micro-optics and light driven technologies. These technologies include a unique approach to surface geometry measurement using an unconstrained range-sensor head [US patent 6,542,249], micro-optic element design for large area light guides and curtains, non-lithographic fabrication of metallic micro-mold masters by laser machining and welding, laser micro polishing and development of several bioelectronic devices that exploit the photoelectric signals generated by dried bacteriorhodopsin (bR) films. Biologically-based light activated transducers represent a new sensor technology that can be fabricated on flexible polymer substrates for creating novel imaging and biosensor systems [USA Patent No. 7,573,024]. Current research involves the development of electrically conductive graphene-based inks and novel fabrication processes for printing electronic circuitry on a variety of mechanically flexible surfaces (e.g. polymers, paper, and biocompatible silk). Laser microfabrication techniques are used for material removal and thermally reducing graphene-oxide (GO) films to produce conductive microcircuit features. The optical transparency characteristics of functionalized rGO circuits are also being investigated. In addition, he has co-edited two CRC Press volumes entitled Smart Biosensor Technology and Optical Nano and Micro Actuator Technology. Professor Knopf has acted as a technical reviewer for numerous academic journals, conferences, and granting agencies and has co-chaired several international conferences.